AC Milan: The Fallen Football Giant – AC Milan Bros.
“Save AC Milan,” the desperate cry by the Milan faithful last season. After the defeat to Maurizio Sarri and his resurgent Napoli side, the fans have begun their plead for change. On Sunday evening, Milan played hosts at the San Siro to Napoli. For about the first 15 minutes, Milan did well to control possession and keep Napoli at bay from getting too many chances on goal. Ultimately, for what has been a common narrative thus far this season, Milan would concede the first goal due to a misplaced pass from Cristian Zapata allowing former-Udinese midfielder, Allan, to open the scoring for Napoli. The second goal would come with a lovely timed right-footed finish from Lorenzo Insigne thanks to a quality pass from Gonzalo Higuain splitting Milan’s defense in half and putting the young Italian international through on goal. Napoli were not finished yet. The Naples-born winger would strike again, but this time with a quality freekick placed right in the top left corner of Milan’s goal to make it a three goal lead for Napoli. The Partenopei would finish off the match with a cross put into Milan’s box from Napoli’s leftback, Faouzi Ghoulam, causing Milan’s young Brazilian centerback, Rodrigo Ely, to accidentally put the ball into his team’s own net. It was a night to forget for Siniša Mihajlović and his men, but it was also a night to reflect on Milan’s current issues and the precursor that has caused these issues to plague such a legendary club like Milan. The match against Napoli was a demonstration of everything that is wrong with Milan. From the players on the pitch to all of the antics off the pitch, Milan has become a fallen giant in the world of football. 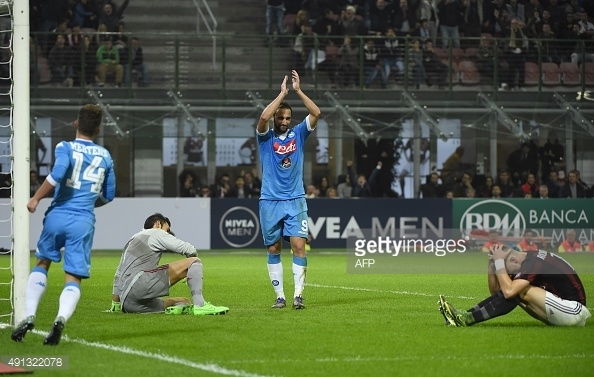 Napoli’s Gonzalo Higuain celebrates the 4th, an own-goal by Milan defender Rodrigo Ely. His reaction says it all. To begin, Milan’s latest summer mercato symbolizes how unaware the management is of the on-pitch issues that exist for this club. For too long has Milan’s midfield gone unattended to. Often, the area would be filled with short-term, cheap, and quick fixes, which all didn’t even put a dent in solving Milan’s biggest issue in the squad. The midfield can be considered the brain of a football team. It’s importance on the pitch is crucial for the performance and success of any team. Without it, a football team simply cannot function well enough to put together a good performance, let alone win a match. Once again, Milan ignored this area that so desperately needed to be reinforced with one or two quality players. As a result, the once most feared club in European football is once again struggling to win matches in Serie A. Even when Milan have the lead, they usually give it up due to a lapse in concentration in the midfield allowing Milan’s defense to be exposed allowing individual mistakes to occur and make a defeat for the Milanese club inevitable. The management’s inability to see how weak the midfield has been is frustrating as Milan have done well to completely reinforce the attack. The likes of Carlos Bacca, Mario Balotelli, and Luiz Adriano allow Milan to have three quality forwards to use in the attack, but without a midfield, how can they be expected to contribute to the team and score goals? For what has been a repeated theme season after season, it often seems like Milan’s midfield can be compared to a bunch of headless chickens where they are unable to be creative enough to allow the forwards to score goals. They also fail to provide cover for the defense allowing it to come under siege to the opposition’s attack. The decision to make Riccardo Montolivo captain has been questionable too. He hasn’t been the player we thought he could be lately. Often looking slow in possession and unable to provide enough creativity for Milan’s attack, he’s hardly a worthy candidate to lead this Milan team. Many Milanisti, including myself believe Nigel De Jong should be the captain, but this hasn’t been the case. Regardless, Montolivo’s captaincy symbolizes Mian’s current state of gloom and despair. Milan’s summer midfield signings of Andrea Bertolacci and Juraj Kucka just haven’t added enough improvement to this Milan side either. They might have shown some flashes at times, but they just aren’t the solutions Milan needed to address their midfield woes. The post-match results explain the entire story of Milan’s current situation. Milan hasn’t been a well-run club lately. The lack of a plan and organization has taken Milan giant leaps backward, instead of forward. To find the people responsible for what Milan continues to represent, which is a shadow of what it used to be, the two men who have the most power within the club must be held responsible. Of course, I am talking about Silvio Berlusconi and Adriano Galliani. There is no reason to sugar coat anything as these two are the reason Milan is what it has become today. Poor decisions in the past have all built up and led to this current moment where Milan are unable to participate in European competition and why the club is not what it used to be. The lack of a coherent plan and vision for the long-term are both two crucial ingredients missing with both of these men at the forefront of the club. 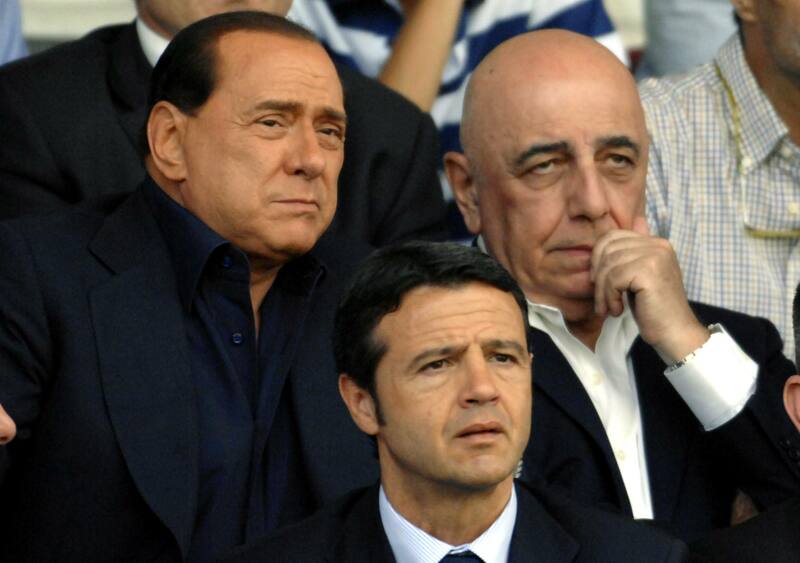 Silvio Berlusconi and Adriano Galliani: Should they stay or should they go? With what funds have been given, Galliani hasn’t done a well enough job to use these funds accordingly and put together a balanced team that could challenge for the top five spots in Italy’s top flight. For example, the decision to sell Riccardo Saponara is one such move that is mind boggling to say the least as he could have been a long-term solution to Milan’s creative problems. Furthermore, the decision to bring in Andrea Bertolacci and Juraj Kucka as Milan’s main midfield reinforcements for a total of 23M euros just doesn’t make sense. The money could have been used to bring in someone else who has the quality and ability to make an instant impact. This new midfield signing could have played along with Nigel De Jong and Giacomo Bonaventura, who were both been crucial players for Milan last season. Mismanaged transfer funds aren’t the only issue with Milan right now. The lack of being honest with the fans is another issue that has gone on for a long time too. The decision to bring in Milan legends such as Clarence Seedorf and Filippo Inzaghi in the past two seasons as coach of Milan was one that clearly didn’t have much thought put into it on the part of Galliani and Berlusconi. It seems they both were brought in one after the other as a way to distract the fans with a sense of nostalgia from the problems that existed within the club. Both would eventually be let go after their seasons as Milan coach ended and it further built up the tension between Milan’s management and the fans. The ongoing deal to sell almost half of the club to Thai businessman, Bee Taechaubol, is yet another scenario that just doesn’t add up and feels more like smoke and mirrors over anything else. Mr. Bee plans to buy a share of 48% of Milan and it was reported the deal would be closed by the end of September, via Football Italia. The end of September has passed and there hasn’t been one word of a deal being reached or any plans in motion for a deal to be reached between the two parties anytime soon. As a Milan fan, it’s frustrating to see the club go on like this. Through all the lies and false promises, it’s no wonder fans never show up at the San Siro. Galliani and Berlusconi are dragging this club down six feet under and their continued false sense of a vision is exactly why Milan will never be able to move forward until both men are completely gone from the club. As quoted at the end of Christopher Nolan’s Batman: The Dark Night, “You either die a hero or you live long enough to see yourself become the villain.” I can’t think of a more appropriate quote to describe Galliani and Berlusconi at the moment. The two of them brought this club back up from a near bankruptcy to make it into an Italian powerhouse in football. Now, they seem to be throwing it all away through their inability to see how out of touch they have become and how distant they have made the fans from the management. With no end in sight, it seems nothing in Milan will truly change until both men step down and allow someone else with a clear vision in mind have a chance to reconstruct Milan into the team it deserves to be. As for myself and all fellow Milanisti around the world, we hope this day will come soon, so we can once again talk about our success rather than our shortcomings.